What these writers say seems to me to clearly point to the need for extensive reading in the language curriculum, if we want our students to become competent readers in the target language. the Project “succeeded in raising the schools’ English language pass rate at ‘O’-level above the national average”. I find these results compelling evidence of the need for extensive reading to be a central part of every language learning curriculum. In my experience, teachers generally assume that extensive reading helps the students became better readers and expands their vocabulary, however these results show that all areas of language learning are affected positively. A major element of in the success of these programmes, however, is the way in which the reading was done. It cannot be stressed clearly enough that for such programmes to work, the students have to presented with books which they would like to read (not those which the teacher wants them to read!). They have to be allowed to read at their own pace, and be given time in and out of class to read. When they have read a book, the right kind of post-reading activities need to be used. For example, if you’ve just finished reading Ian McEwan’s Mann Booker Prize shortlisted novel On Chesil Beach, you don’t want somebody asking you what colour pullover the protagonist was wearing at the start of the story, do you? You want to be asked what you thought of the story, whether you found it interesting, amusing, true to life, what the writing was like and so on. It is imperative not to use the common type of classroom intensive reading activities after extensive reading. Let me make it very clear that I am not saying intensive reading is not necessary, and that we should only do extensive reading with learners. Far from it. Done correctly, class-based intensive reading work feeds the right kind of skills into extensive reading, building up the students text attack abilities over time. But teachers need to be aware of the great differences between the two types of reading. The table below characterises those differences. Intensive reading can often be done through the kind of activities offered in the average course book. Extensive reading is rarely included in course books, although those with long ELT memories might recall the power of the famous story The Man Who Escaped in Robert O’Neill et al’s Kernel Lessons Intermediate published by Longman in the 1970s. The students had usually finished the story a few weeks into the course, whereas it was intended to be read in weekly installments as the grammatical course developed!! The teacher’s role is to explain the aims of the programme and the methodology, keep records of what the students have read, guide students to get the most out of their reading, act as a role-model. Teachers often ask me how it is possible to make such a scheme work in under-resourced, poorly-financed schools. There are basically two options, of which the first is the most difficult: the school should set aside an annual budget for the purchase of a variety of suitable readers, which builds into a large library over, say, a five year period. A further point is that these days, many publishers are making CDs an integral part of the book, so that there are listening opportunities to reinforce the reading. Failing this, the second option is to ask each student to provide the money for one, or better two books each. These then become the class reading pool, and at the end of the year, the students take the books home. The teacher should order the books in consultation with the students, on the basis of what they want to read. This ensures diversity, and the purchase of books at the correct level. It may also be that the teacher can negotiate a suitable discount for a larger order with the local distributor. In class, some time, however small, of each week’s time allocation for English needs to be given over to some aspect of the extensive reading being done. This might include students talking about a book they have read, doing suitable kinds of post-reading activities, such as discussing their book with others who have already read it, completing a wall-chart of books read, changing finished books for a new one, writing a book review and so on. This might be more possible in Brazilian private language schools, but given the limited time available in state schools for English, teachers may have to find some other alternative if they are really convinced of the value of extensive reading. One such possibility would be to have a 30-minute Reading Club session once a week or twice a month outside the normal school timetable. My friend and one-time NILE colleague Alan Pulverness’s Guide (see below) will give you some useful ideas on the right kind of activities to use. I hope you will feel inspired to set up an extensive reading programme for your students. If you would like to discuss any aspects of this with me, please feel free to email me at futured@hu.inter.net. 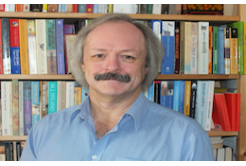 David A. Hill is a free-lance educational materials writer and teacher trainer working out of Budapest, Hungary. He has written two original teenage readers for Helbling Languages (Operation Osprey/The Boy Who Could Fly), and has also adapted eleven classics for them, and one for Penguin ELT. He has written two best-selling young adult/adult readers for Cambridge University Press (A Matter of Chance/How I Met Myself); the latter (a ghost story) is a set book for literature on the Malaysian secondary curriculum. David A. Hill has worked in education since 1970, in British primary schools, then in English language and literature teaching. He has lived and worked in Italy (14 years), ex-Yugoslavia (6 years) and Hungary (18 years). He spent 18 years with The British Council, and 27 summers training teachers in the UK for Pilgrims, NILE, BELL and the British Council. He has worked in over 40 countries around the world and written more than 90 sets of published materials for learners and teachers. David has had 4 original readers and many adaptations of classics published. For 28 years he was involved with IATEFL, holding several posts, lastly as Coordinator of the Literature, Media & Cultural Studies SIG (2008-14). In 2014-15 he selected the materials for the Books on Wheels project for Greece.